Writing at City Journal, Steven Malanga hones in on 10 state governments that have chronic overspending problems. Since 2003, ten states, like impulse buyers wandering through a mall on Black Friday, have repeatedly run deficits, spending more than they generate in taxes, fees, and federal grants, and “pushing off to future taxpayers some past costs for operating government and providing services,” notes Pew Research in a new study. Working from states’ comprehensive annual financial reports, which give a more accurate picture of spending than government budgets, the nonpartisan Pew found that the worst offender was New Jersey, which took in just 91.3 percent of what it spent in the last 15 years. Not far behind were Illinois, Connecticut, Massachusetts, Kentucky, Maryland, New York, California, and Delaware—all in the red for 2003–17, using a combination of debt and deferred payments to live beyond their means. There’s an obvious problem with continually spending more money than you have: it hurts your credit rating. The worse the overspending, the lower the credit rating, and the more it costs to continue your overspending habits through being charged higher interest rates. 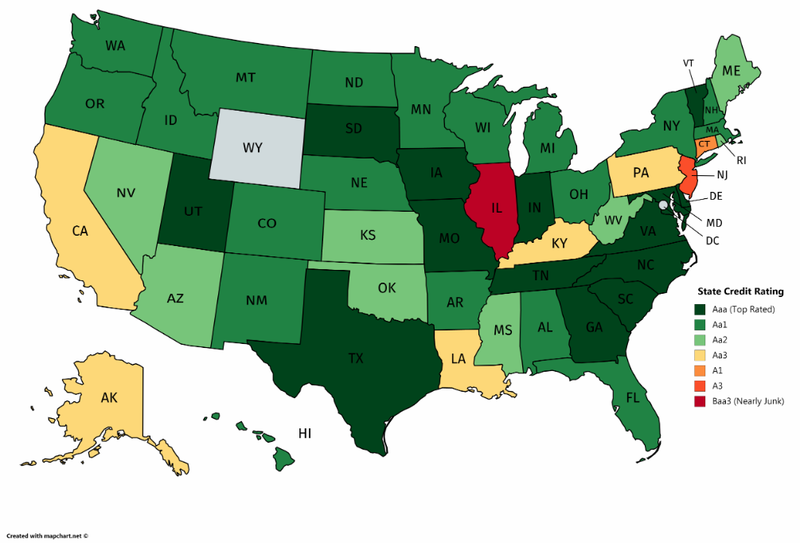 The map below shows how credit rating agency Moody’s ranked each state government’s creditworthiness in March 2019, except for Wyoming, whose credit they don’t cover. In this map, the greener a state is, the better off it tends to be, while the redder a state is, the worse off its fiscal health is. Not surprisingly, the states with the worst chronic overspending history show up with the lowest credit ratings.